University of Washington Press, 9780295992808, 264pp. Deep in the heart of Washington State's Olympic Peninsula lies Temple Grove, one of the last stands of ancient Douglas fir not protected from logging. Bill Newton, a gyppo logger desperate for work and a place to hide, has come to Temple Grove for the money to be made from the timber. There to stop him is Paul, a young Makah environmentalist who will break the law to save the trees. A dangerous chase into the wilds of Olympic National Park ensues, revealing a long-hidden secret that inextricably links the two men. 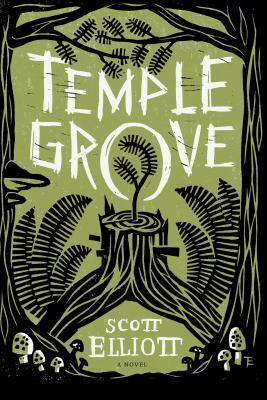 Temple Grove is a gripping tale of suspense and a multilayered novel of place that captures in taut, luminous prose the traditions that tie people to a powerful landscape and the conflicts that run deep among them. Scott Elliott is associate professor of creative writing and English at Whitman College and author of the novel Coiled in the Heart. He lives in Walla Walla, Washington. What is the significance of Tracy’s nickname being Trace? In what ways do worlds collide in Temple Grove? Discuss the presentation of the loggers’ views and the views of the environmentalists. Worlds begin and end in Temple Grove. Discuss how. How important to the plot are secrets? Does this novel make you think about worship and faith—what it means, how we practice it, and how we treat others whose perspective may be different than ours? Who in this novel is redeemed? Who is forgiven? Was Bill “born again” when he emerged from the crevasse? Can this novel be classified as environmental fiction? In the end of the novel, Paul finds his voice. Could he have done this without chasing his father through the Olympics? How integral is place to identity? Could this novel take place anywhere else? There are at least three, arguably four, fathers to Paul in this novel. How does this novel present fatherhood? Discuss the use of music in this novel. Did you have favorite lines in this novel? Which lines did you underline? How do those reflect the major themes of the story? What role does the octopus Pishpish play in the story? What is the significance to the step-father’s job? What is the significance to his melt-down? What does this book say about loyalty?